1. If Possible, Always Carry-On. You’d be surprised how much mileage you can get out of a few well-planned pieces for a long weekend. Plus, you’ll have all of your essentials with you, and it’ll eliminate the fear of ever losing your bag again. Need help packing? 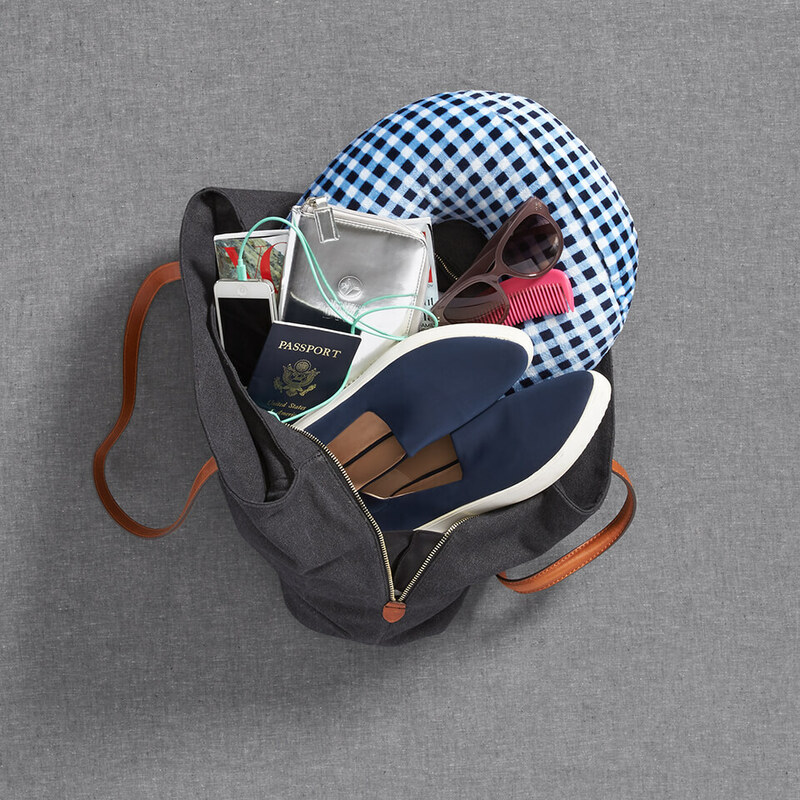 Check out our essential packing checklist to keep things easy. Keep your important documents together in one place. Want a tip? Travel in a lightweight denim jacket, then keep everything you’ll need at arm’s length—your passport, ticket & baggage receipts—in an inside pocket. Your documents will be close by, easy to reach & less likely to fall out of your bag (which is much better used to store all your travel-with-comfort essentials, see photo above). Plus, you won’t be digging through your purse as you walk up to the TSA agent! You know you’ll be taking off your shoes, removing your laptop & putting your 3.4 ounce toiletries in a quart-sized plastic bag. Be smart & wear slip-on shoes, have your laptop out in advance and keep your clear Ziploc (or fashion-forward clear cosmetics case!) at the ready so you can speed through lines. 4. Dress for Speed & Comfort. The airport runway is no fashion show, but you can (and should!) plan your outfit around comfort, a pinch of style & easy-to-remove clothing. Try a pair of skinny jeans (leave your belt at home) with a fitted top & loose cardigan. You can easily remove the looser layer as you go through security. If you’re heading to cold weather, wear a scarf & any heavy outerwear that won’t fit into your bag. And don’t forget cute (or at least matching) socks for walking shoeless through the scanner. Some of your fellow travelers have been there, done that. For some, it’s their first rodeo. Look around you & choose the line that looks like it’s full of pros. A TSA agent who’s efficient & hustling people along is always a good sign, too. Just be sure to give them a nice smile & a thank you on your way through. Do you have any seamless airport travel tips? We’d love to hear your tricks of the trade. Tell us in the comments below!